There is a cool synergy between this card and Rite of the Silver Gate where you can target characters with Silver Gate with perfect knowledge because this card puts the top card face up. Add in a Stone Calendar and you can rinse and repeat to the point of taking out half of your opponents deck. Obviously this is susceptible to support destruction but can be devastating until it is countered. As a newbie, I get that I might not fully understand how the interactions mentioned above are affected by the information in the FAQ, but my counter argument goes like this: Prism states that each player must play with the top card of his deck face up, and the FAQ seems to only put a restriction on cards that are "Revealed" such as in Gate. I get that this might be parsing words ("rules lawyering") but the restriction on Revealed cards doesn't seem to me to apply to this combo. Is there an additional resource I need to consult beyond the FAQ? You cannot reveal a card that is already revealed, is the essence of the ruling. 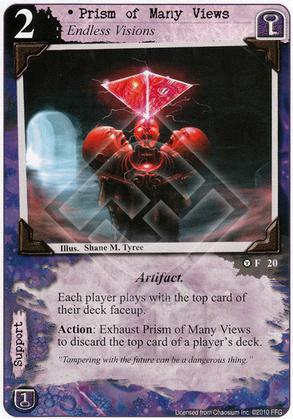 Since the card is already revealed by the prism, it cannot be revealed again by the rite. I can see why you'd be lawyering that "face up" is not the same thing as "revealed" but they are the same thing. I'm confused by this thread. I would have thought the Rite still works; you just reveal the next card instead, no? I'd think you cannot use Rite while Prism active. If that's the case, I guess you also can't use Peter Clover with Martin Herring.